ZillowThe countertops, backsplash and appliances are brand new, while the original cabinets got new paint and hardware. Even with a limited budget and time frame, a major overhaul can be done on a dated kitchen. For example, this 1950s kitchen in Oxnard, Calif., is in bad need of an update. Walking into it was like a blast from the past: The knotty pine cabinetry had funky details, the linoleum floor was still intact from its original installation and overall, the space was cramped and dark. With a little ingenuity, a dark cramped space was transformed into a bright and functional contemporary kitchen. Barring ripping out all the cabinetry, there were easy ways to give this room a complete "facelift" in a matter of weeks. 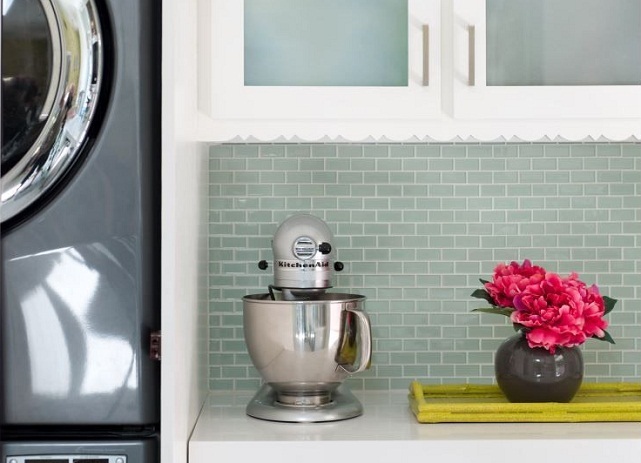 Here are a few tactics from this kitchen update that can work in any space. The kitchen was dark and dated. The most important element of any room is space planning. The overall layout in the kitchen was fine, but the cabinets separating the breakfast nook from the sink area blocked the view and conversation, so those were removed and replaced by a small rounded shelf allowing for a few decorative items -- always a plus in a kitchen. Painted cabinets and new countertops completely change the feel of the room. Open shelving allows for pretty displays. The counterspace was lacking so the oven was moved under the stove to allow for more countertop space next to the cooktop. This move also allowed for one cabinet to be retrofitted with pull out drawers for pots and pans -- a huge plus if you're one that likes to cook! The back laundry room was dark and the space was useless, so a wall was removed and the cabinetry was extended by adding an overhead microwave and the under-counter wine fridge. The solid back door was replaced by a glass door, which now floods the room with light. The addition of a cabinet to close in the washer and dryer and a countertop for folding clothes was added to match the other cabinets and made the kitchen feel like it tripled in size. Big drawers hold pots and pans. The new countertops were done in Caesarstone "Blizzard," and the glass backsplash was bought at a discount tile store. The cabinetry got a fresh coat of paint, with a soft sage green-gray on the bottoms and crisp white on the uppers. New hardware is always key when updating cabinets, along with decorative lighting. A stacking washer and dryer consolidates space. New hardware is always key when updating cabinets, along with decorative lighting. A new porcelain tile floor replaced the original linoleum. The porcelain is incredibly durable and comes in affordable options. Arranging your tile in a creative pattern keeps the interest in the kitchen when using simple materials. Erinn Valencich is known for redefining casual elegance with a modern touch. She recently appeared on NBC's American Dream Builders, hosted by Nate Berkus. Valencich has designed for numerous celebrities and clients around the country through her Los Angeles based firm, Erinn V Design Group. She launched her furniture line and store, Erinn V, on Robertson Blvd in Los Angeles in 2011. Erinn's work has been featured in Elle Décor, Architectural Digest, Town & Country, House Beautiful, Traditional Home, Robb Report, USA Today, Los Angeles Times and more. In addition to her residential work, EVDG recently completed a 650-room hotel and casino in Las Vegas, The Downtown Grand.